Christmas is a magical, joyous time of year, or at least it’s supposed to be! When you have kids, nothing is more magical than watching their little faces light up on Christmas morning. However, the lead up to the big day can be a little less magically and more, well, downright stressful! If you’re already starting to feel the pressure of the holidays, here you’ll find some excellent tips on how to deal with the impending madness. Following the advice below won’t just make things a little easier, it could potentially save your sanity. This tip is especially sanity saving for those juggling a baby and toddler. It’s difficult enough on a normal day to take care of a baby and juggle the demands of a hyperactive, tantrum-prone toddler. However, the lead up to Christmas can be a million times worse. The number one thing that’s going to help out a lot is to bring in reinforcements. Don’t be afraid to ask for help. Whether it be a babysitter to take care of the kids while you go shopping, or asking for help with chores – you’ll be amazed how much stress this eliminates. Try to get one day a week to yourself so you can rest and take care of any necessary holiday chores. If you do have a toddler and a baby to look after, you could also use this period to get your toddler to help out more. Obviously, there’s a limit to what they can do, but asking them to pass things as you change your baby and helping them to realize there are certain times when they need to occupy themselves while you look after the baby will dramatically help. It’s tempting to let things slide during the holidays. Your usual routine can quickly go out of the window. However, if you alter your child’s routine, it’s going to lead to many frustrating problems. If their schedule is changed, it can cause havoc on their peace of mind. Naptime changes in particular can have a significant impact on a toddler’s behavior. So, try to maintain the same schedule as you would all year round. There’s bound to be times when you can’t get a babysitter and you need to take your little one shopping. As you already know, shopping with a baby or toddler can be a nightmare at the best of times – even when you’re just popping to the local store to get groceries. However, holiday shopping is a million times more stressful. There’s more people, you’re often rushing and trying to remember exactly what it is you need to buy. That’s where shopping lists come in extremely useful. Without a list, you’re going to end up stressing out over what to buy and where to find it. This increases the time you’re out and can throw the outing into utter chaos. To make the experience as straightforward and quick as possible, write down everything you need and then separate the items into store and departments. That way, you’ll know exactly where to go and you won’t be easily distracted. Did you know that some stores offer kid-friendly play areas or parenting rooms? Providing a safe space for your little one to play while you shop, these stores make holiday shopping significantly less stressful. Imagine wandering around the store at your own pace, not having to stop your toddler from grabbing everything within reach and not having to ensure an endless list of questions – utter bliss! One of the main reasons parents begin to lose their mind during the holidays is because they’re never home. There’s always a party or some kind of social function to attend. While it’s great your friends and loved ones want to celebrate this magical time of year with you, it can also be really stressful having to drag your kids to one event after another. Don’t be afraid to turn down some of the events you’re invited to. If you can’t get out of seeing certain friends and family members, invite them around to your house instead. It’s still a little stressful having people over, but it does reduce a lot of hassle associated with having to get the kids ready to go out and ensuring they are well-behaved in unfamiliar settings. Of course, there’s also the opportunity to put your toddler in a time-out or to insist on nap time if you’re home and they are getting a little too hyperactive! Around the holidays, it’s common to stock up and indulge in sweet treats. However, as you probably already know, giving sugar to toddlers is a recipe for disaster. Too many sweets and your little one is going to become a whirlwind of hyperactivity. If you’re trying to keep the stress to a minimum, the last thing you need is a sugar-high toddler to deal with! The true meaning of Christmas often gets lost beneath a mountain of presents. Not only does too many presents send out the wrong message to our children, it also causes a lot more stress than it needs to – particularly if you’re on a budget! Start by cutting your present list down. It might sound harsh, but your little one really doesn’t need that many presents. Whether they receive 10 or 100, they are going to be just as happy. Any presents at Christmas are met with glee. If you’ve got a baby, don’t think you have to splash out just because it’s their first Christmas. They’re too young to know what Christmas is and to really appreciate anything you buy them. Too many presents can also be overly distracting on Christmas Day. Your little one will want to play with everything and that generally means a lot more noise and a lot of mess! Another excellent shopping tip (because let’s face it, shopping tends to be the most stressful experience during the holidays! ), is to shop online. The internet is amazing not only for avoiding the holiday rush, but also for saving money. You can save up to half price on everything you need simply by logging online and shopping around. The great thing about shopping online is you can do it at any time which suits you. Wait until the kids go to bed and shop in your PJs if you want to! Often, we build up an image in our heads of how we want Christmas Day to turn out. Unfortunately, the reality very rarely matches up to the high expectations. Your child isn’t going to miraculously behave, it’s very unlikely to run smoothly and it’s virtually impossible to have a “perfect Christmas”. So, think of how you expect Christmas to be and then get that image right out of your head! When Christmas Day finally arrives, you might want to consider spreading out the present opening. As exciting as it is for children to come down on Christmas morning and see all of their presents, it can also be really overwhelming. If you spread it out a little and give them gifts throughout the morning and early afternoon, it can reduce a lot of the stress involved and give you more time to focus on the all important Christmas dinner. Overall, the holidays are always going to be stressful, but following the tips above can help to drastically minimize the amount of stress you need to deal with. Planning ahead is also the best way to avoid the common holiday meltdown! Have you got any tips to reduce the stress of the holidays? Share them below! I don’t think i have anymore relevant tips to add to these good tips already discussed in the post. These are all the wong activities in the manner of your post that makes them go sane when around children and other things during the christmas celebration. I think you nailed it with the post. Thanks for sharing your views and making good tips and recommendations on how to make a festive holiday like chriatmas a stress free period.. 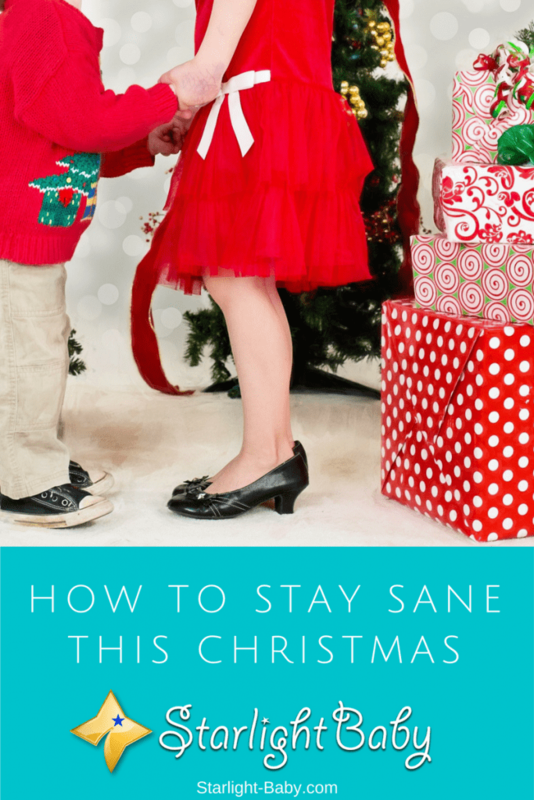 These are all wonderful tips on how a parent can help himself or herself to stay sane during Christmas. Kids can be a lot of stress when there is a celebration to prepare for. So therefore, if you know that you are going to have a very difficult time managing your kids going for shopping, it would be better to shop online and have everything delivered to you at your doorstep.